Sometimes I don’t desire to find out more than what strangers tell me right after I ask the question, so not to spoil the story I imagine. I don’t know if Britania was just visiting New York, like me, or she lives there now. I don’t know if she grew up in a city or out in a country. What I imagine is a little girl growing up on a farm, somewhere in western prairies, mysteriously falling in love with the beautiful game and the Liverpool football club. Ha.. I’m from Minnesota as well. This area is not a soccer area and is saturated with delusional Viking’s fans, angry Timberwolve’s fans and confused Wild fans. 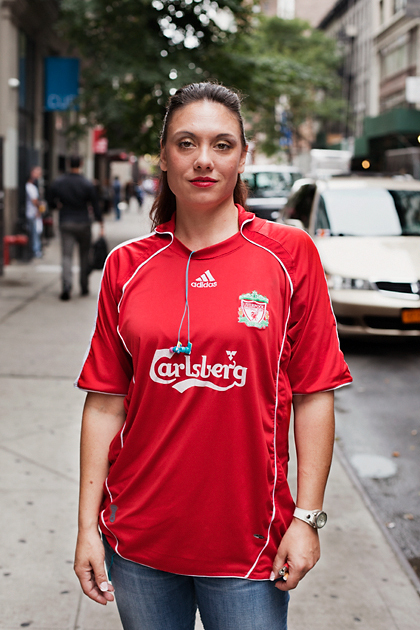 It was difficult to convince somebody to like a soccer team, let alone watch a soccer game. I have come to find that it is easier to like players than teams around here. I have adopted interests in Man U, Barcelona, and The U.S. Team. Powerhouses, the first two. The U.S. not so much… Hopefully some day. Until then, Euro teams it is.